We enjoyed a wonderful dinner atop the Skylon tower, overlooking Niagara Falls. 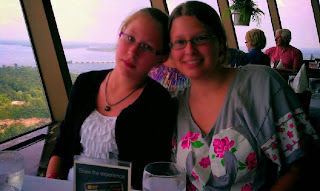 What makes this a splendid place to dine in Niagara Falls is not just the meal, but also the changing view as you dine. The dining room rotates once an hour. The Tower, which is 520 feet tall cost $7 million dollars to build in 1964. After dinner we went to the observation level above to take in more of the splendid views.